NEWS: Today, seven black students got into Stuyvesant High School, one of the most prestigious public schools in the nation, out of 895 offers. The grim statistics will raise pressure on NY's politicians to confront segregation in elite schools. Agree with ⁦@AOC⁩ on this. Improve the schools; don’t change standards for entry into to NYC legendary selective high schools. 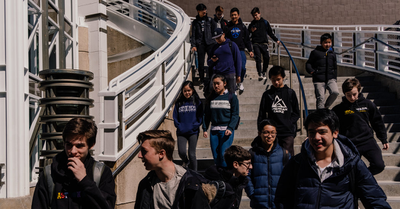 If you read the New York Times article on how Stuyvesant HS is only 7/895th black, with its picture of Smirking White Youths, down to 7th paragraph, you find this parenthetical note: "(At Stuyvesant, 74 percent of current students are Asian-American.)" Come on, this is a total disaster. Serious question: if these are going to exist, why not the top kids from every high school? An old, painful question: "merit," race, and ethnicity. Because admission to Stuyvesant is test-based, 74 percent of the students are Asian. But are they "Asian"? Or individuals? When you stray from looking at people as individuals, you are in difficulty. NYC contains more educated and affluent blacks than any place on earth. But the kids from the richest of those black families can't even begin to compete academically with the very lowest-income Asian kids (most for whom English is a second language). AGAIN. Come at me with case law or anything else, you're not gonna convince me this is that hard of a problem to solve. Shame on @NYCMayor @NYCSchools. @DOEChancellor @NYGovCuomo and everyone else involved for not making this right despite YEARS to do so. When I was that age my friends told me 5-7 black students from their high schools alone who were admitted to Sty. Something has changed & it is not the intelligence of black children. As this NY Times photo proves, smirking white boys are keeping angelic black baby bodies out of Stuyvesant HS. Don’t you want to punch their hate filled white faces? "Only 7 Black Students Got Into N.Y.’s Most Selective High School, Out of 895 Spots"
Appalled by my alma mater. 895 students invited; seven black? In New York City? Not the high school I knew. How can you have a longish article on admission inequities in elite NYC high schools where the sole admissions criterion is a test score....and include no info on the validity of the text? Does anyone know if the test does what ppl think it does? I talked about this story on and off for three hours this morning and shaped a two hour Con Law class around it later in the day: google.com/amp/s/www.nyti… It is an indictment of the NYC school system but I am at a loss to suggest changes. NYC has painted itself into a corner. The phone lines to my radio show are blown out over this story: nytimes.com/2019/03/18/nyr… It probably isn't even eyebrow raising in NYC, but to the rest of the country it is stunning. This just isn't fair --and as @arthurbrooks said yesterday on the show, "fairness" is everything. Only 7 Black Students Got Into N.Y.’s Most Selective High School, Out of 895 Spots nyti.ms/2W2yZgK title is understandable but read the story and the real issue is asian americans are WAY MORE than their "fair" share 🤷🏿‍♂️ at some pt headlines will update "too many asians"
Great reporting by @elizashapiro. NYC is an @UnequalCity. Can we also capitalize Black in the article tho? This is what inequality of pre-high-school opportunity looks like. Only 7 Black Students Got Into N.Y.’s Most Selective High School, Out of 895 Spots. One can take the ignominy of rejection now or get destroyed by all those Asian grinds for four miserable years of repeated & systematic cognitive belittling. I don’t know why they’re trying this Discovery thing. AOC’s right here, make other schools better. To: beloved hs alma mater, my dad's too while we're at it. From: me (white Jewish guy, did no test prep, made something decent of himself) Time to change your admissions policy. This $#*&, from which I benefited, is not fair, just, or good f/NYC. "Though black and Hispanic students make up nearly 70 percent of New York City’s public school system as a whole, just over 10 percent of students admitted into the city’s eight specialized high schools were black or Hispanic."